Many Bermudians and visitors have looked forward to this event annually for nearly a decade and it is safe to say that this year’s event is bitter sweet as we bid farewell to a great event on the Bermuda calendar. Notwithstanding, we are most appreciative for the free tickets offered to locals by the PGA of America and urge all to come out and show their support – a way of us saying thank you. Port Royal Golf Course Director of Operations Greg Maybury, 1st Assistant Steven Lambert, Golf Course Superintendent Dennis Pilgrim, Director of Golf Alex Madeiros and the Bella Vista Grill Restaurant led by Livio Ferigo and Gordon Reid, have all been overseeing hard working teams who are not only committed to ensuring this year’s event exceeds all expectations but they show pride all year round representing our great public golf course which has been in the world spotlight since 2008. Golf course conditioning is key to its success and for the PGA Grand Slam of Golf, the greens at Port Royal are smooth, rolling fast at a consistent pace; while the fairways are lush from the rains with thick Bermuda grass rough offering punishment for an errant tee shot. Large crowds are expected at Port Royal, and we have already seen an interest in the event from persons who are not regular patrons of the game. Hopefully, they will be inspired as we honoured by the presence of world number one Rory McIlroy, Martin Kaymer, Bubba Watson and/or Jim Furyk. The presence of four major winners at Port Royal is special in and of itself but to also have an in form World #1 ‎in the field is awesome for Bermuda – Rory’s presence at this stage in his career presents other opportunities for Bermuda going forward. Golf fans young and old are afforded a rare opportunity to see first hand golf at its finest by the very best in the game. 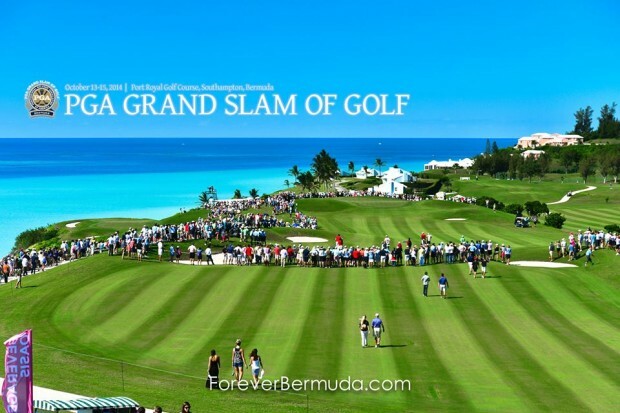 ‎The PGA Grand Slam of Golf featured on our spectacular south shore coastline, played on our world class public golf course, which embraces all stratas of society both locals and visitors, portrays Bermuda at its best. Golf for more than a century in Bermuda, has brought visitors to our shores from all walks of life – hosting royalty, world leaders, top executives, families and everyday man and women from around the globe. Today the spotlight is on Port Royal Golf Course, through it all, Port Royal’s welcoming spirit as a public golf facility and our association with the PGA Grand Slam of Golf has showcased Bermuda at its best. We encourage sporting enthusiast and the general public to make a point of watching this year’s PGA Grand Slam of Golf at Port Royal Golf Course. Free tickets for residents are available until Octo‎ber 10th. We invite the public to come out to Port Royal and witness world number one Rory McIlroy, Masters Champion Bubba Watson, US Open Champion Martin Kaymer and major champion Jim Furyk and experience golf at its best in Bermuda. “Come see world number one Rory McIlroy, Masters Champion Bubba Watson, US Open Champion Martin Kaymer and major champion Jim Furyk and experience golf at its best in Bermuda.” That last sentence says it all:-( Indeed it certainly will be a bitter-sweet occasion. Great article. I played golf with Kim Swan and it’s great to see that he’s still hitting the greens. He was MVP when at University. Now lets see you on TV Swanie. We love Port Royal (played there in the late 80′s) and Bermuda! It would be nice to have the LPGA or Chapions Tour stage an event here in the near future,as our course lengths are suitable and pose the perfect chellange for the pros from both tours. Very good point, Jack straw. When the GS goes we need something to replace it on the golfing calendar. Otherwise as a golfing destination we are really down the tubes, so to speak. I think you mean the Champions Tour though mate, unfortunate typo. Yes Bermuda Tartan. Silly mistake on my part. That pesky ‘m’ managed to elude me this time around. Lol. I’m glad you understood what I meant though.